María Cristina Díaz Salazar is a Mexican lawyer and politician affiliated with the Institutional Revolutionary Party (PRI). She is a former municipal president (mayor) of Guadalupe, Nuevo León. Today, she is senator for the state of Nuevo León. Díaz Salazar studied law at the Universidad Autónoma de Nuevo León (UANL). She is an active member of the PRI who has occupied various positions inside her party including president of the PRI in Nuevo León. She has served as advisor for the IMSS, head of the National Institute of Migration in Nuevo León, local deputy in the Congress of Nuevo León, and has served in the Chamber of Deputies of Mexico during the LVI and LIX Legislature. In 2006 she was elected to serve as municipal president (mayor) of the municipality of Guadalupe. She was the secretary general of the PRI, until December 2, 2011. After the resignation of Humberto Moreira as President of the Institutional Revolutionary Party, she became the interim president of the party; but when Pedro Joaquín Coldwell took office as president of the party, she became the secretary general of the party again on December 8, 2011. ^ "Declaran a Moreira y a Cristina Díaz "legítimamente electos"". La Crónica de Hoy (in Spanish). 9 January 2011. Retrieved 9 February 2011. This article about a mayor in Mexico is a stub. You can help Wikipedia by expanding it. This Mexican law-related biographical article is a stub. You can help Wikipedia by expanding it. Marcela Guerra Castillo is a Business Administration major and Mexican politician from Nuevo León. She was Local Deputy of Nuevo León's Congress and twice Federal Deputy of the Congress of Mexico. Currently Mexico Senator for the period 2012-2018 by the state of Nuevo León in the LXII Legislature of the Mexican Congress. Blanca Alcalá Ruiz is a Mexican politician. From 2008 to 2011, she served as the mayor of Puebla, the capital city of the State of Puebla in Mexico. She was the first woman mayor in history of the city. On August 2017 she was named Ambassador to Colombia. Miguel Ángel Barberena Vega was a Mexican Naval officer and politician. Pedro Pablo Treviño Villarreal is a Mexican lawyer and politician who served as state secretary of Labor in Nuevo León from 2010 until 2012. federal deputy for the 2012–2015 period by Nuevo León's 12th Federal District and Chairman of the Committee on Budget and Public Accounts in the 62nd Legislature of the Mexican Congress.. Managing Director of Lotería Nacional para la Asistencia Pública and Pronósticos para la Asistencia Pública until September, 2017. Currently, he is President of PRI's State Steering Committee in Nuevo León. 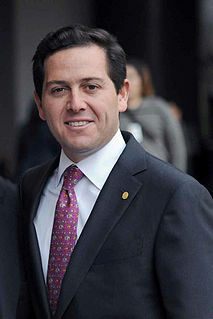 César Octavio Camacho Quiroz is a Mexican lawyer and politician affiliated with the Institutional Revolutionary Party. He served as Governor of the State of Mexico between 1995 and 1999, as Senator of the LVIII and LIX Legislatures of the Mexican Congress, and as Deputy of the LX and LXIII Legislatures, all representing the State of Mexico, and as president of the PRI between 2012 and 2015. Esthela de Jesús Ponce Beltrán is a Mexican politician affiliated with the Institutional Revolutionary Party. She has served as a deputy of the LIX, LXI and currently LXIII Legislatures of the Mexican Congress, each time by way of proportional representation. Carolina Monroy del Mazo is a Mexican politician and member of the Institutional Revolutionary Party, currently serving as the secretary general of the PRI and as a federal deputy to the LXIII Legislature of the Mexican Congress, representing the XXVII Federal Electoral District of the State of Mexico. The Confederación Nacional de Organizaciones Populares is a political institution of the Institutional Revolutionary Party (PRI) in Mexico. It was founded in 1943 and has historically served to represent the middle and lower classes within the party organization.